Apprising Ministries continues documenting the spread of Counter Reformation spirituality and Contemplative Spirituality/Mysticism (CSM) ala gurus Dallas Willard and his spiritual twin Living Spiritual Teacher and Quaker mystic Richard Foster spreading within largely pretending to be Protestant evangelicalism. 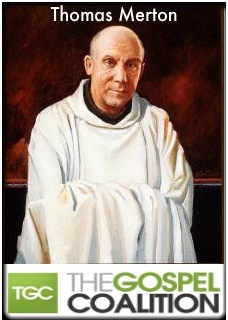 By all accounts apostate Roman Catholic mystic monk Thomas Merton (1915-1968) is a superstar of CSM, particularly the practice and teaching of its crown jewel, a form of meditation in an altered state of consciousness commonly known as Contemplative/Centering Prayer (CCP). I’ve told you earlier about Merton’s life-long devotion to spurious CSM, and most particularly CCP, the so-called “Christian” form of transcendental meditation. As I showed you in Thomas Merton And The Buddhas CCP made him far more like the Buddha than anything resembling the Christ. “O-kay,” you ask, “but what does this have to do with the Gospel Coalition blog?” That’s a good question; let me show you. I point you now to The iPhone as Hitchhiker’s Guide to the Galaxy, an October 26, 2011 post by Mike Cosper, “pastor of worship & arts” at Sojourn Community Church. that expression, le point vierge, (I cannot translate it) comes in here. At the center of our being is a point of nothingness which is untouched by sin and by illusion, a point of pure truth, a point or spark which belongs entirely to God, which is never at our disposal, from which God disposes of our lives, which is inaccessible to the fantasies of our mind or the brutalities of our own will. This little point of nothingness and of absolute poverty is the pure glory of God in us. It is so to speak His name written is us, as our poverty, as our indigence, as our dependence, as our sonship. It is like a pure diamond, blazing with the invisible light of heaven. No doubt “the stress of ministry” can wear one down who’s ministering in his own power; however, TGC contributor Mike Cosper then needs to turn to apostates—Biblically, enemies of the cross of Christ (cf. Philippians 3:18)—for a retreat? Really; I think it’s well past time for evangelical leaders to ask why? Silence is CSM-speak for the practice of CCP. So again we ask: Is The Gospel Coalition really ok with this? Thomas Merton, Conjectures of a Guilty Bystander [New York: Doubleday, 1966], 158, emphasis mine.